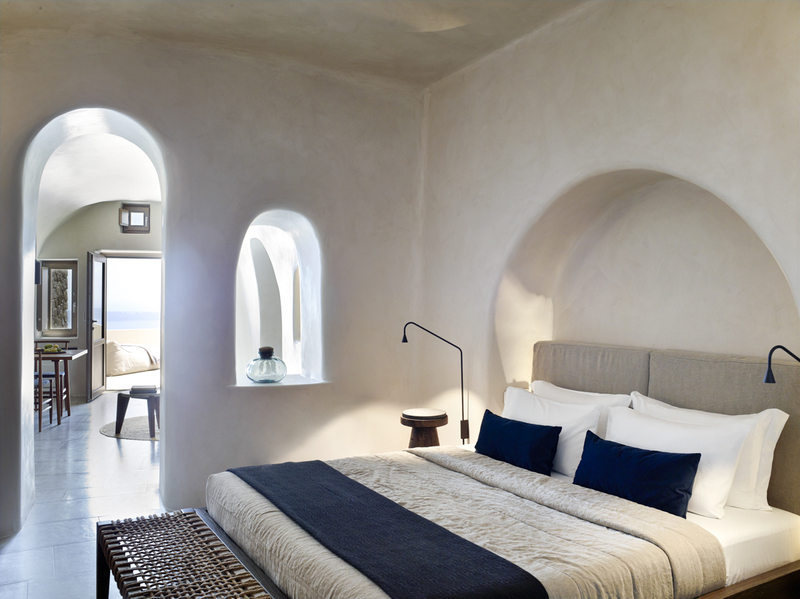 With a prime cliffside spot at one of the highest points of Santorini, one-bedroom Villa Omikron is a one-of-a-kind escape. 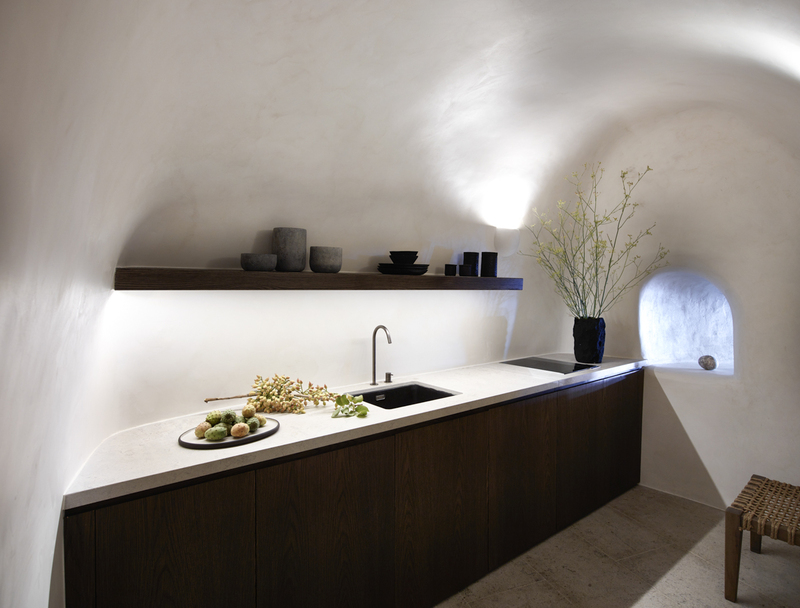 It’s a peaceful haven of smooth arching walls and natural colours: think muted beiges and greys and smooth marble stone. 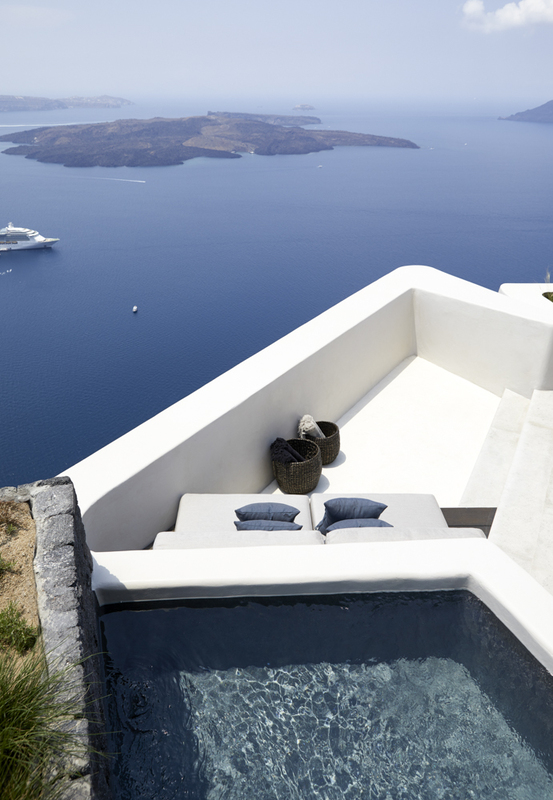 Outside, the Aegean-facing veranda features a comfortable beanbag, alfresco dining table to seat four and a glistening outdoor spa tub. Beyond that, there’s a view that has to be seen to be believed (and even then it seems surreal). 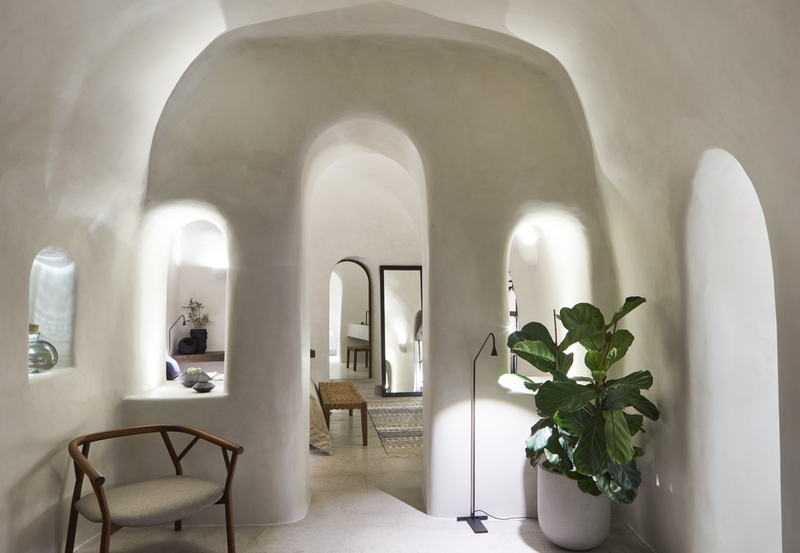 The luxury villa boasts a modern interior with custom-made furniture and is complete with oval-shaped archways for a dose of traditional style. The freestanding marble bathtub, double sink and walk-in shower will make you feel like you’re in a luxurious spa rather than a bathroom, while the compact yet dynamic open-plan living, kitchen and dining room with a cushioned-adorned sofa and chic pouffe provide the ideal opportunity for you to put your feet up and relax. 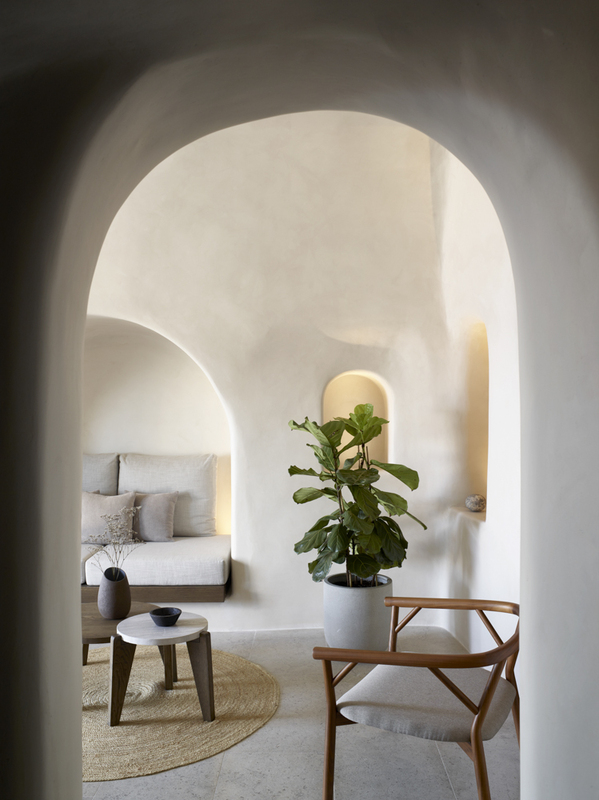 Step through the archway into the spacious bedroom, equipped with a king-size bed and contemporary wardrobe space for neatly storing your holiday belongings. 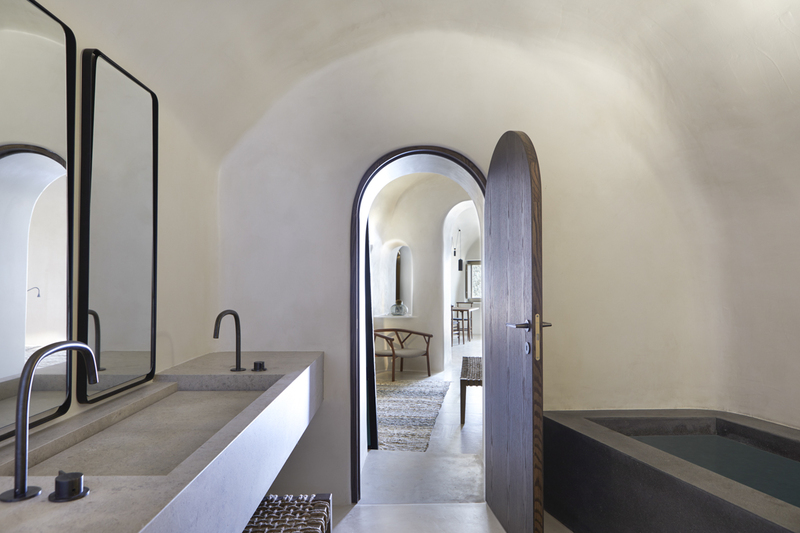 A full-length mirror, wall-mounted television and patterned rug complete the home-from-home touches. 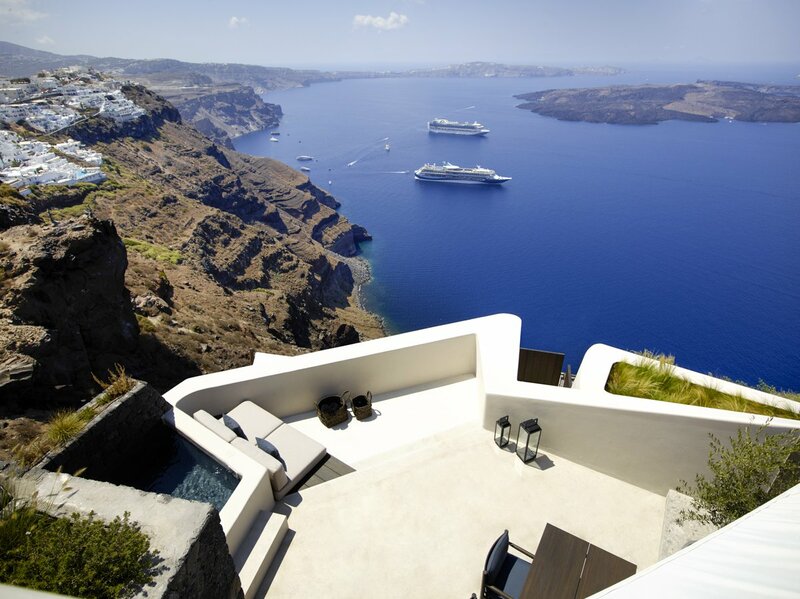 By day, you can while away the afternoon on the terrace basking in the sun and by night soak up the magical sunsets over a glass of wine – Santorini is well known for its fantastic wineries in the region. With cube-shaped, white-washed houses draped in pretty bougainvillaea flowers lining the craggy mountainous hillside, this stunning part of Santorini is picture perfect. Explore the exciting archaeological treasures, swim in the crystal-clear waters, wander the cobbled streets or tantalise your taste buds at a local taverna. Whether you want to unwind and relax or immerse yourself in the vibrant Greek culture, this dramatic Cyclades Island has you covered. 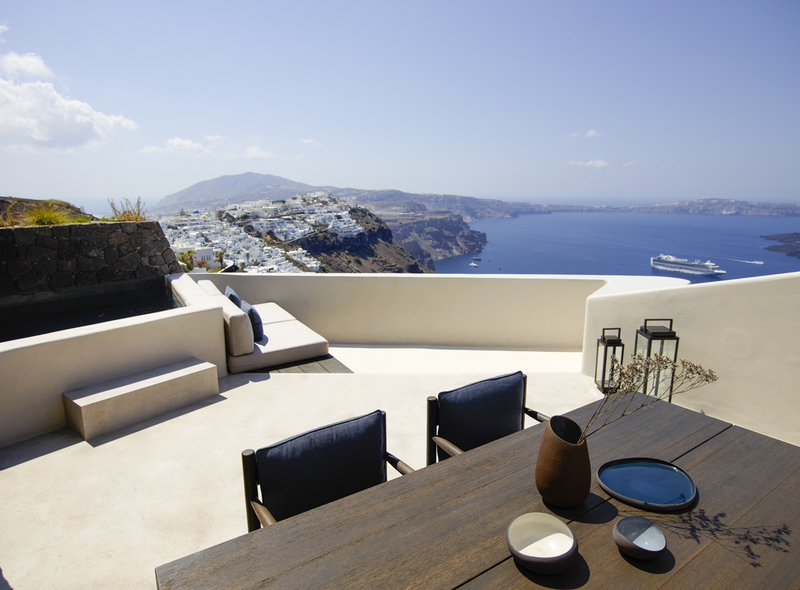 Villa Omikron is in Imerovigli, a beautiful village on the dramatic island of Santorini. It’s adjacent to the capital Fira and is famous for its beautiful sunsets. 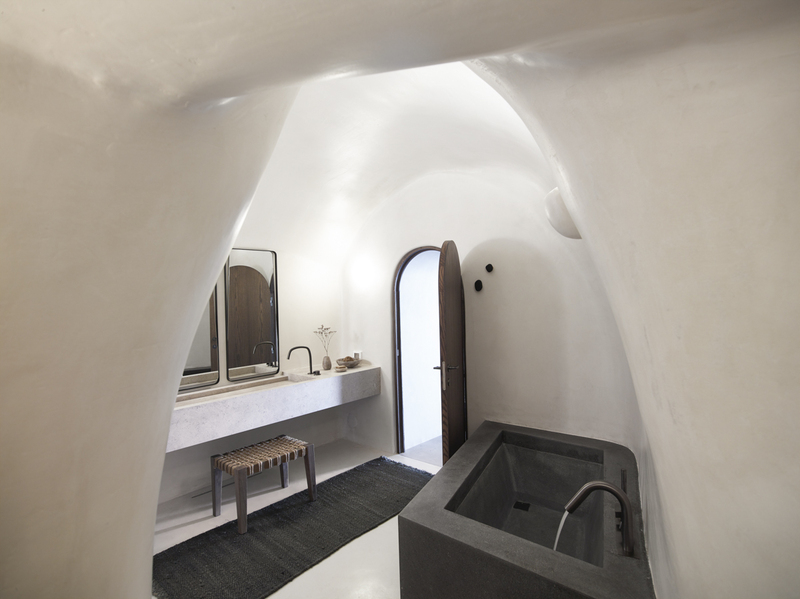 Classic cube-shaped houses are in abundance and come hand in hand with the breath-taking views. You’ll find plenty of lovely tavernas and high-quality restaurants, serving everything from freshly-caught seafood to traditional moussaka. Spend your afternoons wandering the cobbled streets, browsing the boutique shops selling everything from souvenirs to home-made goods or visiting the sapphire domes. Stop off for a classic cold coffee or a bite to eat. By night, Imerovigli is usually peaceful, and you can enjoy local wines with the stars. For a bit more choice, you could drive about 10 minutes to the popular village of Oia with cosy café-bars playing lounge music or the capital, Thira, with its livelier bars and clubs. Thira is also known for its shopping, and the capital’s streets are packed with clothes, shoes and ceramics – and it’s famous for its jewellery shops too selling expertly-crafted gold and silver. Oia, on the other hand, has lovely art galleries and places to pick up handmade pottery and amber trinkets. To experience the beauty of Santorini from new heights, you can walk along the edge of the caldera from Thira to Oia, which usually takes about three hours. The tranquil route goes through the pretty village of Firostefani, past the monastery of Agios Nikolaos on the way to Imerovigli and ends at Oia. On the way, there are little beautiful churches to see and plenty of tavernas for rest-stops and breath-taking vistas. For a shorter route, you can, of course, start at Imerovigli itself. For offshore adventures instead, jump on a boat excursion to explore the nearby volcanic features and untouched coastline. Some boats stop off for a traditional lunch and time to swim and snorkel. Adrenaline junkies might like to part in water sports like sea kayaking and parasailing, and scuba diving is also a popular choice in Santorini. There are nearly forty dive sites, mostly around the caldera and its islets. Aspronisi with an abundance damselfish, the World War II wreck between the two Kameni islets or the well-preserved freighter with parrot fish is top choices.